September 18-19, 2018 | Spire Events Center, Washington D.C. The 2018 GEOINT and Open Source Analytics Summit will focus on techniques and resources aimed at integrating open source technologies into today’s GEOINT landscape. This educational summit will engage US military commands, government agencies, and technology providers in a town-hall forum to highlight the impact of open source data combined with sensitive information to develop a holistic GEOINT picture. 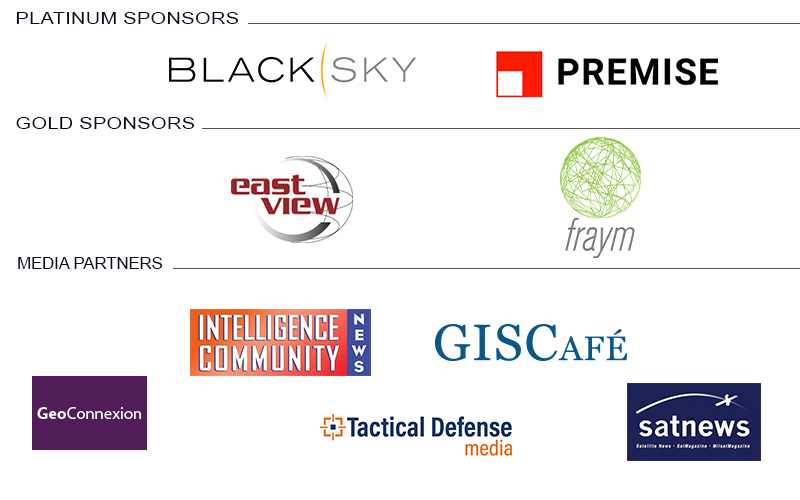 * Weather Notice/ The GEOINT & Open Source Analytics Summit will occur as scheduled. Per the National Weather Service, effects from Hurricane Florence will be south of the Washington DC metro area. We will continue to monitor developments as they relate to Florence and update attendees if there is a need. This educational summit will enable the Intelligence Community, military intelligence organizations and industry partners to come together in a collaborative forum to encourage honest dialogue to address the technical vulnerabilities of the Intelligence Community focusing specifically on GEOINT. In today’s technological era, the IC has been seeing increased importance and reliance on the ability to harness and exploit open source data to enhance GEOINT. This forum will discuss the efforts to couple commercial open source data with classified information and how this combination enhances the quality of GEOINT brought to key decision-makers. The main objective of this year’s discussion will be integrating this open source information and effectively exploiting it in a timely manner. Overall, this summit will feature senior level discussions of the latest efforts by government agencies and organizations to utilize geospatial and open source data for critical missions. Such a dialogue in a non-attributed setting, will allow for solution providers and thought-leaders to join together in vital discussion regarding the advancements and progress of GEOINT resources and tools. This summit offers several distinct opportunities for a few organizations to demonstrate their technologies or solutions that address the summit subject matter, or to partake in a thought leadership role. If you are an organization that would like to learn more about how you can be involved, please visit us at the Sponsors and Supporters Page. Gain Education & Insight: Walk away with knowledge gained from our senior level speakers on some of the complex challenges facing intelligence officers and analysts. Build Partnerships: The agenda is designed to allow for ample networking opportunities and the ability to discover some the latest technologies helping process, exploit, and disseminate big data. NGA, US Army Geospatial Center, Adobe, AECOM, Aerojet Rocketdyne, AFRL/ Information, Directorate, AG/RPD, US Department of State, Airline Ambassadors International, BAE Systems, Bloomberg L.P., Blue Compass, LC, Booz Allen Hamilton, Boundless, Cal Poly Office of Research & Economic Development, Carahsoft, CCRi, CollabraSpace, Compass, Inc., Concurrent Technologies Corporation, Continental Mapping, Consultants, Crunchy Data, CSRA, DAn Solutions, Inc., DeepSequence, DellEMC, DHS, DIA, Diffeo, Digital Reasoning, DigitalGlobe, Directorate of Nuclear Treaty Monitoring AFTAC/TTX, DOE, Dun & Bradstreet, East View Geospatial, Envitia Inc, FEMA, First Mile Geo, General Dynamics IT, General Dynamics Mission Systems, Geographic Services, Harris Corporation, IBM, INA Solutions, Inc., Innovative Decisions, Inc., In-Q-Tel, Institute of World Politics, Janus Research Group, Jefferson Institute, KEYW Corporation, Inc., Leidos, Lockheed Martin, MacAulay Brown, Inc., MapLarge, MapR Technologies, Marine Corps Intelligence Activity, MarkLogic, Mathworks, MDA Information Systems LLC, Modus Operandi, New World Solutions, LLC, NIST, Noblis NSP, Northrop Grumman, Northrop Grumman Mission Systems, Novetta, Oak Wood Controls, OG Systems, Open Source Enterprise, Organon Advisors, PAR Government, PixElement, Planet, PlanetRisk, Praescient Analytics, Quaestor Federal Consulting, RadiantBlue Technologies, RG I, SAIC, SAS, SDL Government , Sentrana Inc, Software AG Government Solutions, The HumanGeo Group, The Radiant Group, The Sanbron Map Company, U.S. Navy, United States Geological Survey, Ursa Space Systems, UrtheCast, US Army, , Vencore, 377 Omega, Inc, and more!